Attention Deficit Hyperactivity Disorder (ADHD) is a behavioral disorder that mostly affects children. Symptoms include hyperactivity and difficulty paying attention, which later interfere with their home life and schooling. Adults with ADHD may have difficulty managing time, setting goals, being organized or keeping a job. This may lead to relationship problems, addiction and low self-esteem. Several studies have shown the connection between food and ADHD. Food plays a role in the behavioral disorder and examining a kid’s diet can be a good approach to reducing ADHD symptoms. The following are dietary changes that adults and parents of kids with ADHD can do to deliver relief of symptoms. Protein-rich foods such as eggs, fish, beans, poultry, pork, nuts, lean beef and nuts may have positive effects on ADHD symptoms. These foods are used by our brain to make neurotransmitters, which are released to communicate with the brain cells. Protein can prevent blood sugar surges that increase hyperactivity. Having protein for breakfast can help the body create neurotransmitters. To help manage symptoms of ADHD, protein can be combined with complex carbs that are low in sugar but high in fiber. The key is to reduce the amount of sugar. Sugar is not just found on sweets. Simple processed carbohydrates such as waffle or bread are turned into glucose quickly. It is best to choose high-protein; complex carbs and fiber-rich foods in the morning or noon for the sugars are taken more slowly. 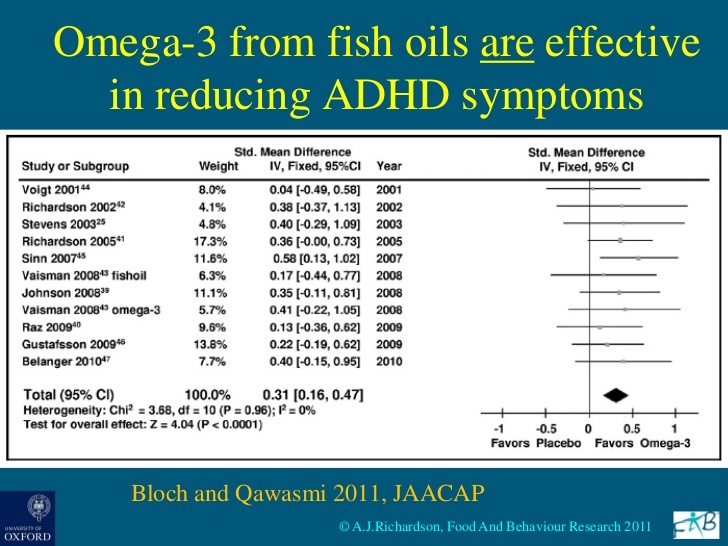 Omega-3 are said to be good on ADHD symptoms. 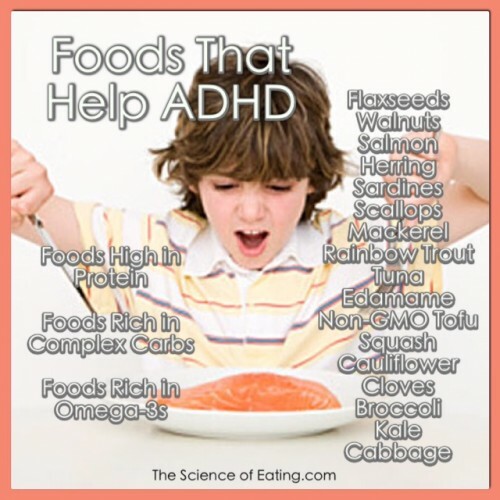 Children with ADHD should include foods rich in omega-3 fatty acids to their diet. It optimizes brain function and boosts the synthesis of dopamine, which is the neurotransmitter that is being increased by medicines. Omega-3 comes in different forms. Children can get a dose of 700 to 1,000 milligrams a day and get more EPA or eicosapentaenoic acid than DHA docosahexaenoic acid. Iron plays an important role in controlling ADHD symptoms. This is backed by a 2004 study that showed children with ADHD has lower iron levels and another study showing that increase in iron level improved their symptoms. Before increasing the iron levels, make sure to test for ferritin level first. Remember, high iron levels are also harmful, so better ask the doctor first. Iron-rich foods include pork, poultry, seafood, red meat, beans, spinach and raisins, to name a few. Aside from iron, the minerals zinc and magnesium, may also play vital role in ADHD. Zinc regulates dopamine. Magnesium is responsible for building neurotransmitters connected with concentration and attention. It also has calming effect in the brain. Have your child tested for zinc and magnesium levels, if this yields low levels, better supplement them by including spinach, chard, pumpkin seeds, almonds and black beans in their diet. Some herbs were seen to help manage symptoms of ADHD. 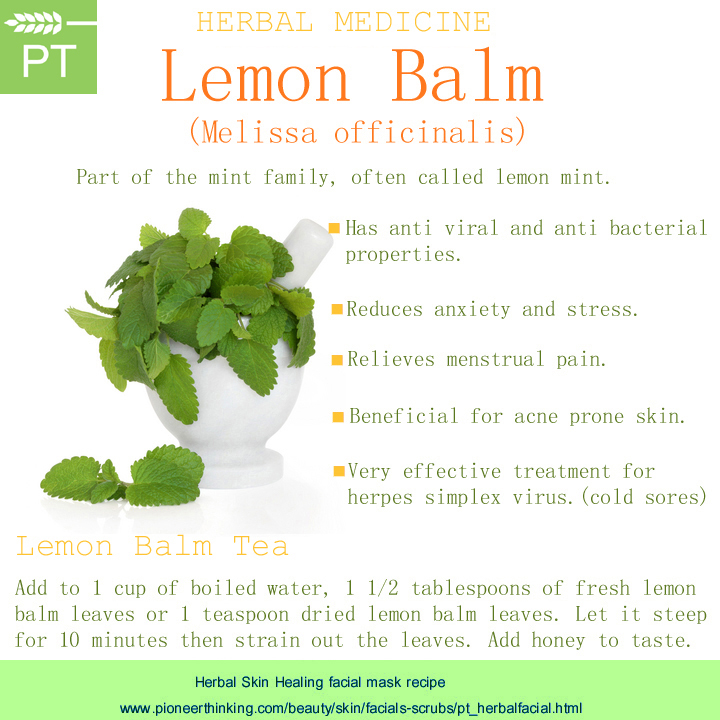 These include Valerian and lemon balm. A combination of the two can relax children by reducing their anxiety. The herb pycnogenol has also been shown to be beneficial for it improves concentration. Consult professionals about the right dose and the right herbal products to buy, if you opt for supplements rather than the fresh ones. Kids love to eat every so often, so most parents stock on snacks at home. Choosing healthier snacks is good for every kid, and not just those with ADHD but if you have to deal with managing ADHD symptoms, it is always best to go for the healthier options. Les Mills suggests a list of healthy alternatives for Instead of having packaged fruit snacks, you can always go for fresh fruits and reap the benefits, like the vitamins found in it. Ditch potato chips that are high in additives. Go for homemade popcorn or baked chips. Instead of ice cream, choose yogurt; dried fruits and nuts instead of candies. Several studies have shown that artificial additives are not good for ADHD for they can worsen the symptoms. Typical examples of foods that contain additives are candy and cheese puffs, but be mindful of other foods that have artificial colors and preservatives. Read labels. Stick to fresh and unprocessed foods for your best bet. Be wary of artificial colors such as yellow and red, and additives like nitrites, sodium benzoate, monosodium glutamate and aspartame. Studies have shown that small amounts of caffeine may be good for children with ADHD, but the side effects could outweigh any benefit. Most doctors still recommend less caffeine intake or avoid it altogether. It was first used to increase attention of patients since caffeine is a stimulant, but later on, its ineffectiveness was discovered. Diet does not cause ADHD and diet alone cannot account for its symptoms. The right diet for children with ADHD does not differ much from those who do not manifest the behavioral disorder. However, in terms of managing symptoms, the key is to pick foods that are good for the brain like those discussed on the overall nutrition. It helps to keep a routine when feeding your child. Set a regular time for meals and snacks. Avoid skipping a regular meal, which can lead to overeating later. Be mindful of what your child eats for snacks and stock up on the “good” ones. In the long run, he or she will benefit from the overall health benefits of eating nutritious foods. Doctors agree that healthy, balanced meals reduce the symptoms of ADHD. If you or your child are used to eating unhealthy, switching to a healthier diet may not be easy. It helps to be a healthy eater yourself to help your child develop good eating habits. Consult your doctor if there are supplements your child can take. Choosing the right path of healthy eating and starting from childhood will bring benefits to last a lifetime, so be patient. Your child’s diet and health depends on you, whether or not he suffers from ADHD. This article Guest Posted by Sagi Solomon, the relationship manager of InboundJunction. Want to submit a guest post? Read HealthResource4u guest submission guidelines. Filed Under: Child Health, Diseases & Conditions Tagged With: ADHD, adhd treatment, What is ADHD?